It may have been spectacular to watch but stage nine’s mass start that saw the leaders head of in a drag race in groups of ten, failed to deliver quality racing. With Dakar’s elite riders all being so evenly matched it meant they spent the entire day riding together. 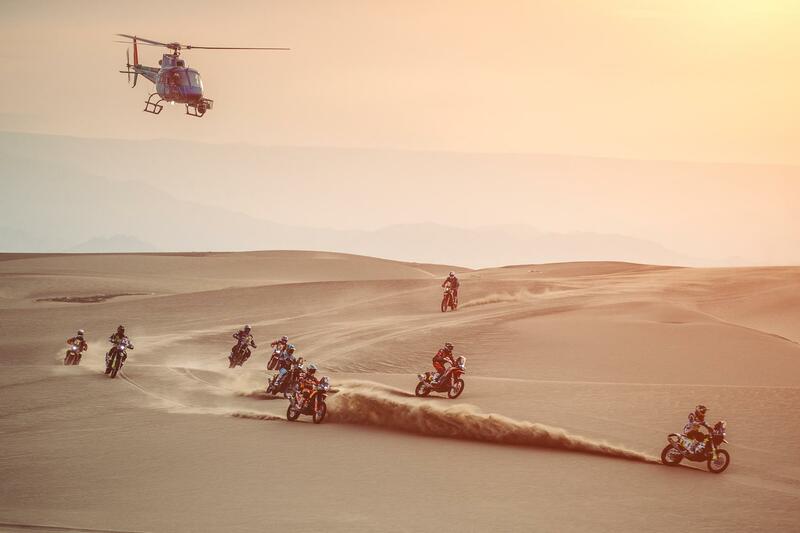 At the end of the day Sherco rider Michael Metge who started in the second wave of riders won the stage making him the seventh rider to take a stage win on Dakar 2019. Out of the first wave of riders who are fighting for overall glory just two seconds covered the top four with race leader Toby Price consolidating his overall lead despite riding in pain from his badly damaged wrist. Price leads by just 1m 03s ahead of Husqvarna rider Pablo Quintanilla with just one 70 mile timed Special Stage remaining. But while it was a good day for Price, it was disaster for KTM team-mate San Sunderland who was hit with a one hour time penalty for allegedly tampering with his navigation electronics on stage eight. It comes as a bitter blow for the Brit who had fought himself back into contention with two stage wins following a broken rear brake caliper that caused him to lose 20 minutes. It was also a disappointing day for fellow Brit Richard Main and at time of writing the 53 year old was not registering any times after the initial way point meaning he could be out of the race.